In this one-day, six-hour online course, the learner will evaluate the art and science of generating leads. The course examines the lead generation process from identifying viable leads, to qualifying them, and to converting them to clients. The course will also review the tools and techniques necessary to implement a successful lead generation strategy that is adaptable to your business and target market. Lead Generation—identifying the sources of leads and how to nurture those relationships. Lead Incubation—determine the most effective techniques for maintaining top-of-mind awareness. Lead Conversion—applying scripts and communication strategies for qualifying and converting cold leads to warm ones. Tools and Systems—identify the tools and systems that are most effective for tracking and communicating with prospects. Tracking Leads and Analytics—understand the importance of tracking leads. Online Lead Generation—Explain the most effective techniques for using websites and social media for generating leads. Throughout the entire course, applications of the National Association of REALTORS® (NAR) Code of Ethics on communication with prospects is thoroughly discussed. Articles 12 and 15 of the Code specifically cover issues relating to advertising and communications, and statements about other real estate professionals. In addition, other legal and ethical considerations, especially the laws governing intellectual property and copyright are addressed. 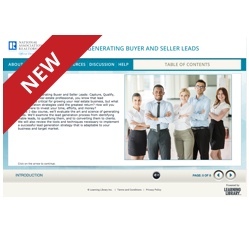 The Generating Buyer and Seller Leads Course counts as one REBAC elective course to be applied towards the ABR® Designation. The content provider is the Center for Specialized REALTOR® Education (CSRE). CSRE is a wholly owned subsidiary of NAR.